…will not become one that is filled with stuff about school. Anyway, that was when I found out I got accepted to the Fully Employed MBA Program at the Graziadio School of Business and Management at Pepperdine University. Since my Dad’s passing, I’ve been less guarded about some of the things I’m posting. For instance, I never ever would have considered posting my Dad’s first and last name on my blog while he was still alive: I value the privacy and safety of my loved ones. The day after I wrote the above was my Mom’s birthday. It was the Friday before Labor Day weekend. My brother brought her over and we all (Mom, Bro, Yoshi and me) had a late lunch together from Al-Wazir Chicken. Later that evening, we celebrated Mom’s birthday at the Hollywood Bowl. The program was movie music, conducted by John Williams. The second half of the program was basically all his music, some of which was played to movie clips on the big screen. We were all amused by the light sabers that came out when they played the Imperial March from Star Wars. I was happy that we could spend Mom’s birthday together, but it was bittersweet that Dad wasn’t with us… well other than being with us in spirit, that is. Mom and Bro spent the night at our place and on Saturday morning, Mom and I got up early to go to San Gabriel for an appointment. Mom got up earlier than I did and watered the garden at my place, something I have never done in the 2-3 years I’ve lived here. Later, Bro met up with us at Grandma’s house. I can’t remember what else happened that weekend. This is why I should write things down more often. It just so happened that we all happened to be free for dinner… Bossguy, me and Yoshi… so we ended up at Sushi Nozawa around 7pm and were seated right away at a table. We turned off our cell phones as soon as we sat down. 3 “Trust Me” Specials. A large Asahi, a Diet Coke, and a water. The Special is selected by Nozawa-san, aka the Sushi Nazi… he picks out what he’ll serve you; omakase: chef’s choice. “Trust Me,” it says. Tonight’s Special was baby tuna sashimi (maguro) in ponzu sauce, yellowtail (hamachi, probably my favorite) sushi, red snapper (tai) sushi, crab rolls (fresh crab), large scallop (kaibashira) sushi, and fatty tuna (toro) roll. This wasn’t regular sushi. It was fresh, high quality sushi. Served in a very modest, unpretentious strip mall off of Ventura. On plastic plates. Who cares about the plates? The food was delicious. I would not question Nozawa-san and would trust him to serve only the best. We weren’t in the line of fire (the sushi bar), so Bossguy dared to take a call on his cell phone (he was hiding it) and even asked for fruit for dessert to Mrs. Nozawa (no, we didn’t get any and it was good thing he was about to pay). No one was dumb enough to ask for a California Roll. So we didn’t get kicked out. Yes, people have been thrown out for not following the rules. (Rumor has it that Charlize Theron was thrown out of here a few years ago.) We were in and out in under an hour. And when we left there was a line out the door of people waiting to get in. I know some people poo-poo this place because of the lack of ambiance, service, decor, whatever. But I, for one, enjoy good food and since Bossguy was buying, the high cost of such a meal wasn’t an issue. 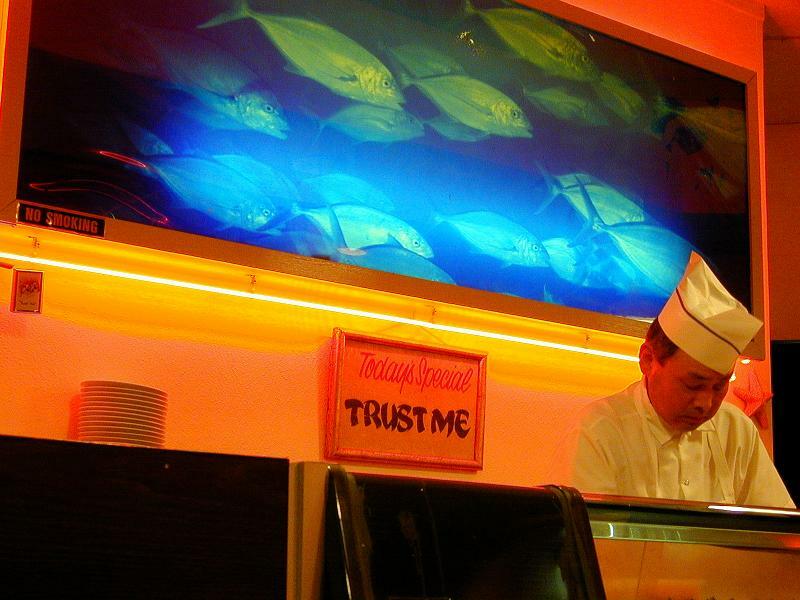 Check out what others say about Sushi Nozawa. This weekend marks 8 weeks since my Dad passed away. Two months. I’ve been counting the weeks because my Mom, Bro, and I have spent the last 7 Saturday mornings at the place where my Dad’s ashes are interred. In Buddhist tradition, the funeral ceremony lasts for the first 7 weeks (7 weeks x 7 days = 49 days) after someone passes away. Although it’s been hard, I found solace after my Dad’s Memorial Service in going to the weekly chanting services every Saturday morning (every 7th day) with my Mom, Bro, and other assorted family members and close friends at the Rose Mausoleum/Pagoda where my father’s ashes were interred last month. The Buddhist Columbarium at Rose Hills is also where my Grandfather (Dad’s Dad) and Grandmother (Mom’s Mom) had their ashes interred. My Dad’s niche is right next to my Grandfather’s. I would cut flowers from my front yard and bring them as offerings for the service and leave them by my Dad and Grandfather’s niches. This week, I didn’t do any of that. Now that it’s the 8th week, my “new” routine has come to an end. I know that Buddhists stress the impermanence of life and the inevitability of death, but it still makes me sad to realize that my Dad is gone in the way I knew him. The last two months have simulatenously flown and crawled by. I felt sad that I didn’t go visit my Dad’s ashes on Saturday, but I realized that it wasn’t realistic for me to do so every week. I had to give myself permission to make other plans that morning. Instead, I went to an appointment in San Gabriel and then visited my grandmother. In the afternoon, I went back home to visit/help my Mom around the house. My Dad’s photo, the one we had to select and have enlarged for the Memorial Service, has been placed prominently on the mantle, kind of like an altar. When I used to walk through the front door, I used to yell loudly into the house (depending on who was home), “MOM! DAD! BRO! I’m home!” When I got home, my Mom ran to the front door to let me in. And my brother wasn’t home. So I had no one to yell to. So then I just said hi to my Dad (well, his picture, anyway) and told him I was home, kind of like how I used to. Except it was definitely not the same. I spent the rest of Saturday in the garage, aka: my Dad’s office, rifling through boxes and boxes of stuff that my parents had saved from our childhoods. My Dad was an architect and an art lover. As a kid (ok, as a teenager, too), I used to pore through his library of books about Picasso, Miro, Monet, and more… My parents saved countless pieces of artwork my brother and I had made. I dug through boxes and boxes of my schoolwork from junior high and high school, throwing out years and years of homework and notes… kept because of all the “A’s” I’d earned over the years. (Sheesh, I was SUCH a nerd!). I found years and years worth of letters I’d exchaged with pen pals over the years. And I threw out all kinds of flyers and other papers from various high school activities I’d participated in. And I felt sad because even though all these things were in the past and I didn’t need to hang on to them, when I saw all these things that I’d kept over the years, a flood of memories came back to me of all the things our family did together and I worried that without these things to remind me of them, that I’d forget them forever. So then I had to give myself permission to throw all these things away and remind myself that the memories weren’t in the things, they are in me. I still haven’t really gotten to the point that I really want to say more than a few words about my Dad and I’m definitely not at the point that I feel like I can write about it, but then I worry if I don’t just put it down, will I never get to it? There are all these things I’d wanted to do with my Dad, especially things like writing down our family history and to do a blog with him about Taiwan/Taiwanese independence. It makes me hurt when I think about it all because now we’ll never get to do these things together. Now I also want to make a website about my Dad, something to memorialize him with. (Nevermind the fact that I had promised my Dad I’d help him build one for the stuff he was working on while he was alive.) But it’s overwhelming to go through the stuff and organize it all, and I’m scared I won’t do him justice. So now I’m scared that I’m going to be stuck in this strange rut of doing nothing because I’m overwhelmed and afraid I won’t do things good enough. I guess all I can do is to give myself permission to do things a little at a time, remind myself that my life is different and that I’ve got to move on, and that my Dad would want me to be myself and live my life fully, not to be paralyzed by this. So maybe as one of these first baby steps of getting my life “back to normal,” I have to give myself permission to blog again. To realize that before this happened, I had no problem writing about things that were insignificant and that I every post I write doesn’t have to be about my Dad anymore. That I shouldn’t feel like people will think I’m not thinking about my Dad all the time, especially when I’m not writing about him all the time. And I have to give myself permission to write about my Dad when the impulse strikes and not to save it up to a time when I can “write something well,” because time is precious and sometimes it’s more important to just write it down, even if it’s not perfect. I have to give myself permission to also spend my time with my friends again and that I don’t have to feel guilty if I don’t spend every free moment with my family: balance is important. I guess that’s enough permission for myself for the moment, so I’ll indulge with another photo of me and my Dad. In the one below, I would guess that I’m maybe 5 to 7 years old, based on the dress I’m wearing. I can’t remember the context of the photo at all, but I know that we are in the family room of at my Grandparents’ place. That couch has long since been replaced and the light on the right now sits in the living room of my parents’ house, but everything else in the picture is pretty much the same. Except for the people, of course. 8/8 (Eight-Eight in Mandarin is pronounced “ba-ba.” Father in Mandarin is also pronounced “ba-ba”) is Father’s Day in Taiwan. Even though we refer to him as “Dad” in English, 95% of the time, we called him “Ba-Ba.” Usually, my Dad would be in Taiwan at this time of year, so I would have to remember to call him on 8/7 so I could wish him a happy Ba-Ba Day on the right day. Sometimes I would forget about the time difference and he’d get the call on 8/8 LA time, 8/9 Taiwan time. 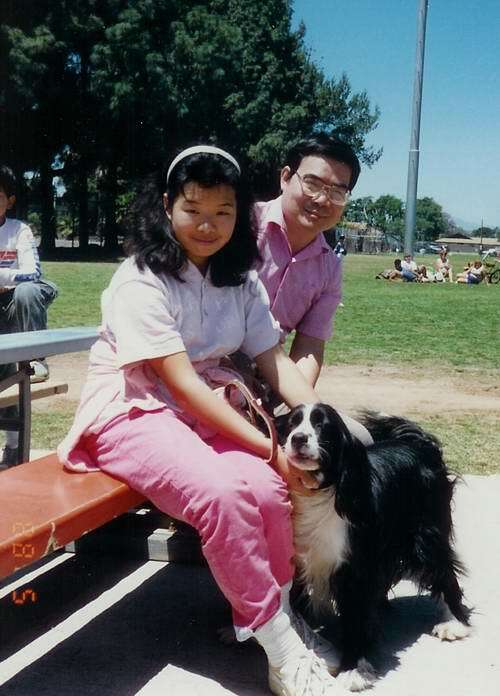 Here’s a picture of me, my Dad, and our dog DJ from the year “ba-ba” (1988). I’m pretty sure it was taken at one of my brother’s Little League games. Back then, our grandparents would come over on the weekends to watch my Bro’s games. We would often bring DJ with us, too. I have no words to describe exactly how I’ve been feeling for the past two days. I am lucky to have so many good friends. I know there are more posts out there and lots of people who left comments, sent emails, left IMs, sent text messages, sent cards via snail mail, called to check up on me on my phone, etc, etc. I am so grateful. Let me know if I somehow missed you if you made a post on your blog. Thanks again. I can’t believe it’s been a month since my Dad passed away. I can’t believe it’s been more than a month since my Dad’s brain hemorrhage. I can’t believe the last time I spoke to him and talked on the phone was to tell him that I got a 100% on my Accounting test. I can’t believe the last time I saw him was waving goodbye at him from my car the night his car broke down. I can’t believe the last meal we had together as a family was on Father’s Day. I can’t believe my Dad has passed away. Since my Dad traveled so much, I keep feeling like he’s just in Taiwan for a few months and that at any moment he’ll send me an email or text message to see how I’m doing or just call up and tell me to go pick him up at the airport. It’s the times when I realize that this isn’t going to happen that it starts to sink in a little. And then I go back into that state of disbelief again. How can it be that someone as young as he was (he was only 61) as healthy as he was (he NEVER got sick) have a brain hemorrhage and never wake up? Maybe it happens to other people or strangers or people who live far, far away, but it wasn’t supposed to happen to anyone I knew and certainly not to my Dad. Or so I thought. People keep telling me about the “5 Stages of Grief,” but I kind of felt like I went through all these stages in the days when my Dad was still in the hospital and I found out that my Dad wasn’t going to wake up from his coma. While we were planning his service and making all the arrangements, I felt like I was in some crazy nightmare. In some ways the service (which at some point I should write about) helped me move to another point, but since it was all a blur I kind of feel like I never woke up from that dream and I’m still wandering around like a half-asleep zombie. So I don’t know what the hell I’m going through now because I’m either a mess of emotions or I’m the total opposite so I can get through the day. The only way I can really describe how I’m feeling now is that I feel broken-hearted. Yes, I’m also still in shock and disbelief, and I’m sad (maybe a little depressed), and I’m emotionally exhausted. But what it comes down to is that my heart feels like it got shattered into a zillion pieces and I’m just grateful that the love of my Mom, Brother, Yoshi & other friends and family have been here to help me pick up the pieces and try to put it together again. Except I know that even with all the king’s horses and all the king’s men, my heart will never be the same as it was before. So anyway. I don’t know what I should say now. Except that despite everything I said above, I’m ok. Really, I am. My brain feels scrambled and I just don’t understand how it’s possible for time to move so slowly and so quickly at the same time. But I’ve been back at work and I’ve been back at school (yes, school. I know I never blogged about it, but I started an MBA program at the beginning of this year.) and I’ve been helping my Mom and Bro handle the things for my Dad that we’ve needed to handle and I go through most of the motions of living my life and I go through each passing week a day at a time, every hour at a time, every minute at a time… but nothing quite feels the way I think it should feel. Someone told me that the only thing that heals this kind of heartbreak is time… I know it’s possible, but how come I feel like it will never happen for me? Dad & Joz: circa a long time ago. I’m not sure when this was taken but I love how happy my Dad looks in this picture. The jozjozjoz.com archives for August, 2006.